At what price peace of mind? 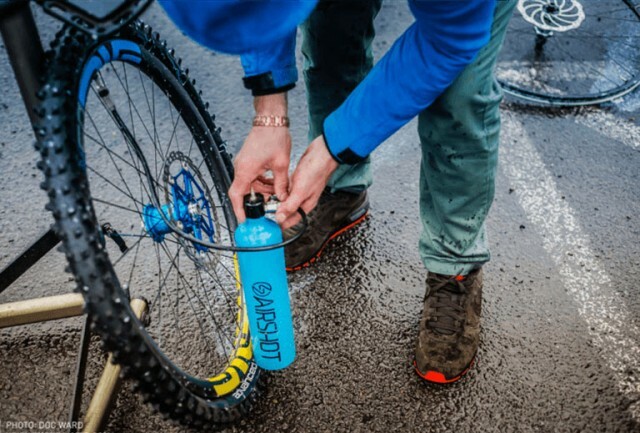 Lying somewhere between DIY kits and tubeless seating pumps from Bontrager and Topeak on the I might just be maimed spectrum, Britain’s own Airshot system consists of a pump-pressurised vessel with a high-pressure hose and valve intended to quickly, easily, and safely seat tubeless tyres. While tyres and rims have improved considerably over the past several years, there are always combinations (usually involving used tyres covered in dried sealant) that give us fits. 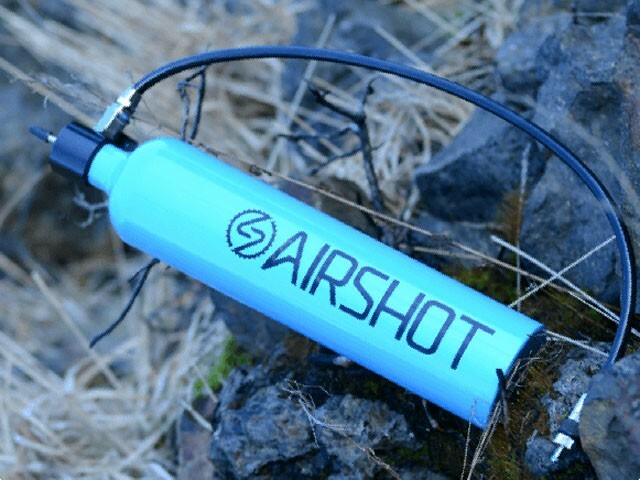 Rather than resorting to frantic curse-interspersed pumping, Airshot would have you pressurise their portable alloy bottle to ~150psi, and then unleash the furies in a single blast. 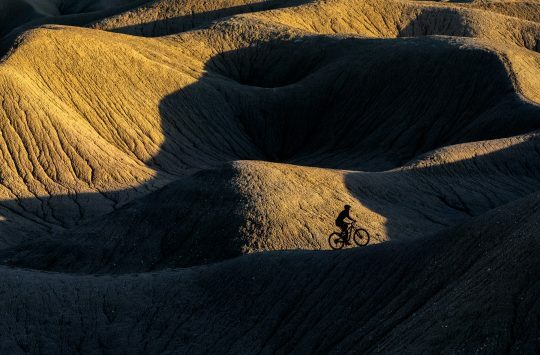 It’s essentially a refined version the forum-favourite DIY methods involving soda bottles – or a BYOP[ump] version of the Singletrack-Recommended Bontrager Flash Charger or Topeak’s new Booster. Unlike CO2 cartridges, if the Airshot fails to seat on the first go, there’s plenty of opportunity for a do-over. Add air gradually, release air explosively! As many mechanics know, one of the easiest ways to allow more air through the valve more quickly is to remove the Presta core. 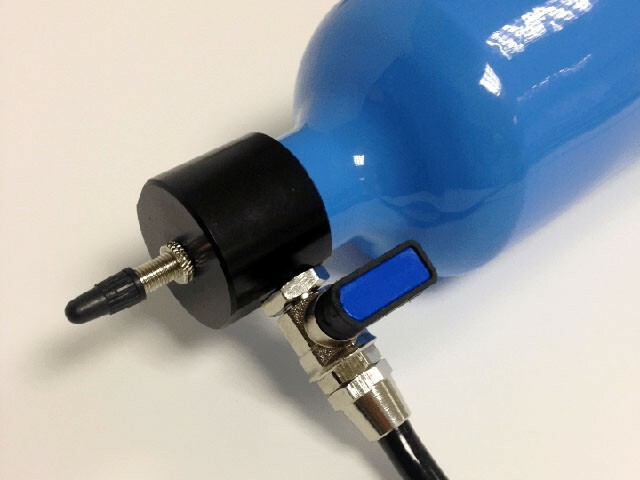 Airshot has this approach covered – the kit comes with an adapter that screws directly into the valve stem (core removed) for more free air flow. That’s a little piece that might sell well if offered separately. So how much is peace of mind and the absence of faff worth? Airshot reckon £60 – 40% less than the Bonti Flash Charger. What say you all? Had one for a couple of months, works as advertised even with troublesome tyres. Hmmm, sixty quid does seem a bit steep for a strong bottle and a valve, but I don’t fancy taking my face off with an old coke bottle either. I think whether you want this product depends on your current pump, already have a really nice track pump? get this, if you need a new track pump anyway, get a Bonty/topeak integrated jobbie. Had mine for months and absolutely love it. Coke bottles and other bodged solutions are fine, but I can guarantee that when I’m racing in the depths of winter and I’m trying to change tyres in the dark in a car park, and temp is sub zero, that will be when the bodged solution fails on me. This is foo proof and works every time for me. 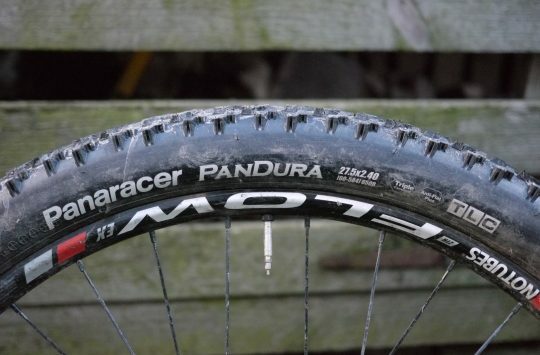 I have a great track pump that gets 95% of tyres on, but the 5% it can’t are always the ones you really need in a rush. 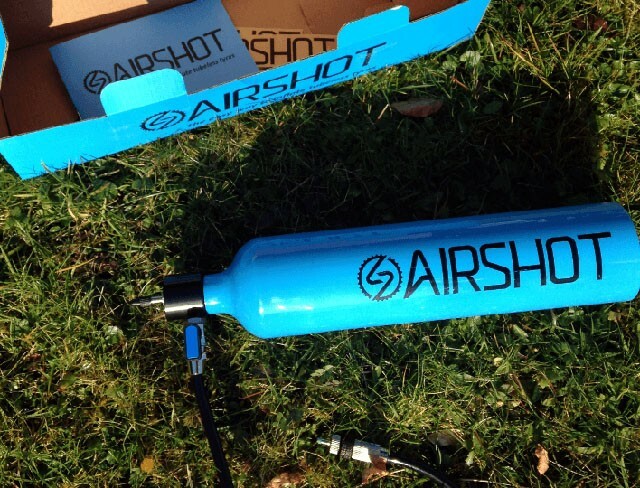 And yes, you could by a compressor for a few more quid, but they’re not exactly portable, which is the whole point of the Airshot. I’d say 40% less than the flash charger is too expensive. I have a compressor. It’s massive, heavy and needs 240V mains to run it. Wouldn’t have been much use camping this summer, when the Airshot saved me a lot of hassle after a shredded tyre. Brilliant. Just works, yes it’s not cheap compared to some alternatives but it removes all the faffing of seating tyres. I have one and it’s brilliant seals basic £20 ish Minions on my Mavic ust rims every time. Had one for a while, very good on stubborn tyres. Goes in my Evoc when I go abroard. Try that with a compressor. It’s a solution to a problem that’s caused by people not using proper techniques. £60 is the price you’re paying to *not* learn something, to make it a bit easier to get your tyres to inflate. 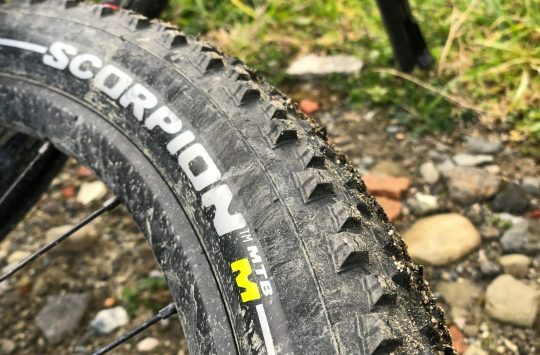 Also, if some tyres really wont inflate without a compressor – then it’ll be a total pain to sort them out if they puncture. The cheap solution is, experience, tyre lube, no valves, big air volume pump. Yeah had one since last winter and it’s been an absolute joy to behold! So much so friends are using it for their setups as well. I “learned” that it was easier to use the Airshot than doing it the “proper” way.